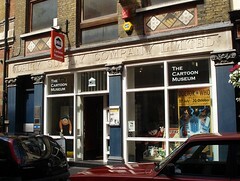 A warm and welcoming little museum in Bloomsbury celebrating cartoon strips and comics over the ages. Note: As of early 2019, the Cartoon Museum is closed in preparation to move to a new site on Wells Street near Oxford Circus, and is due to reopen in the Spring. The museum has lots of comfy chairs throughout, and copies of the Beano to peruse. There is also a permanent exhibition of classic cartoons. Past exhibitions have included a retrospective of Ronald Searle's work, including his St Trinian's and Molesworth illustrations. As well as a comprehensive show of his work since WWII, the exhibition featured a very good filmed interview. Admission prices are £5.50 for adults, £4 for concessions, and £3 for students. Entrance is free for under-18s, Art Fund members and Friends of the Cartoon Museum. A student multi-visit card valid for five visits over a year is £10. Bec's verdict: Friendly and fun for all ages! Last visited by Bec, mid-2010. Opening hours and prices taken from the Cartoon Museum website, June 2013. Last edited 2019-02-05 18:50:08 (version 8; diff). List all versions. Page last edited 2019-02-05 18:50:08 (version 8).